Few NFL players can say the rode the bus to Canton, Ohio. Jerome "The Bus" Bettis did just that on his way to the Pro Football Hall of Fame. Widely viewed as one of the greatest running backs of the Super Bowl era, Jerome Bettis cards should enjoy a boost due to his HOF honor and will likely remain strong going forward. Shop for Jerome Bettis cards on eBay. The bruising back first made his name at the University of Notre Dame. After strong seasons as a sophomore and junior, Jerome Bettis left school early for the NFL. The Los Angeles Rams selected Bettis as the 10th overall pick in the first round and he quickly rewarded the decision with an NFL Offensive Rookie of Year Award. After two Pro Bowl seasons, Bettis' production dipped in his third year and the Rams, fresh off a move to St. Louis, traded him to the Pittsburgh Steelers. Jerome Bettis was reborn in Pittsburgh, reeling off six consecutive 1,000-yard seasons and adding four more Pro Bowl visits. Although his career took a noticeable downturn at age 30, he remained a featured element of the Steelers offense. This all culminated with a Super Bowl title and Bettis' retirement following the 2005 season. He finished his career with the sixth-most rushing yards in NFL history. As one of the most beloved figures in the storied legacy of the Pittsburgh Steelers, Jerome Bettis cards and memorabilia see good interest and value. However, most of his cards remain quite affordable and certified autographs can be found for as little as $40. 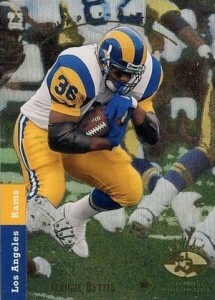 The following guide looks at five great Jerome Bettis football cards. They are by no means the most valuable or rarest options for Bettis, but simply appealing cards that would make a nice addition to any collection. Many collectors generally gravitate toward rookie cards and Jerome Bettis has several. View a full rookie card checklist for the "The Bus" in our comprehensive player profile. The key rookie card for Jerome Bettis is found in 1993 SP Football. The foil card has a premium feel, especially for the time, but they can be quite delicate. Regardless, this is the preferred card for most collectors. A popular autograph line, especially with basketball collectors, Autographics from Skybox covered the NFL as well. This early autograph set features on-card signatures for Jerome Bettis with both black and blue ink. The limited Blue Ink parallel has a reported print run of 50 copies. Because of the elongated signature utilized by Jerome Bettis, more space is better for collectors. The horizontal layout featured on 1999 SP Authentic Player's Ink is an ideal canvas for Jerome Bettis' on-card autograph. In addition to the green version, there is also a purple parallel that is hand numbered to 100. A favorite among high-end collectors, Five Star is known for on-card autograph and premium designs. The 2013 version for Bettis is ornate and limited, with plenty of signing room. For most people, signing their name as simply "The Bus" would likely lead to many questions centered around their sanity. However, among football circles, it would be immediately clear who was being referenced. Not all collectors would be interested in a signed card from Bettis that does not actually include his signature, but there is something oddly intriguing about the limited card from National Treasures. 1993 Upper Deck Football Jumbo Foil Box Mint 9.0 Favre & Jerome Bettis Rookies! 1998 Playoff Momentum Headliners Gold #23 Jerome Bettis 10 BGS 9 MINT!